The collection is laid down on the rectos of 43 leaves of a 4to folder, on pages printed with borders and headed with the name of the Museum. Items in good condition, with the usual aging to newspaper cuttings, in worn folder. Folder in original buff wraps with, printed on front wrap, 'Compiled and Edited by WILLIAM E. APPLEBY', and with the subject given in manuscript as 'Atomic Models & Machines (MEL) Zeta.' Last page with note by Appleby: 'Zeta | Science Museum | Made by | [signed] William E Appleby'. Contains a manuscript list of 87 entries by Appleby for Miniature Engineering (London) Ltd, on four folio pages, headed 'Drawings for model Zeta Brussels 1958', with 'Remarks' and 'Description'. Also a fold-out plan: 'ZETA I | EAST ELEVATION', and a fold-out diagram: 'MINNIE CRUCIFORM DISTRIBUTOR FRAME STUDS'. Also twenty black-and-white photographs, including many showing the public examining the model through a window from the street; and numerous newspaper cuttings from a variety of sources ranging from the Scotsman and Daily Mail to the Southend-on-Sea and County Pictorial. Also a press release, 'Great Britain at Brussels', for the 'Brussels Universal and International Exhibition, 1958', dated 15 April 1958. 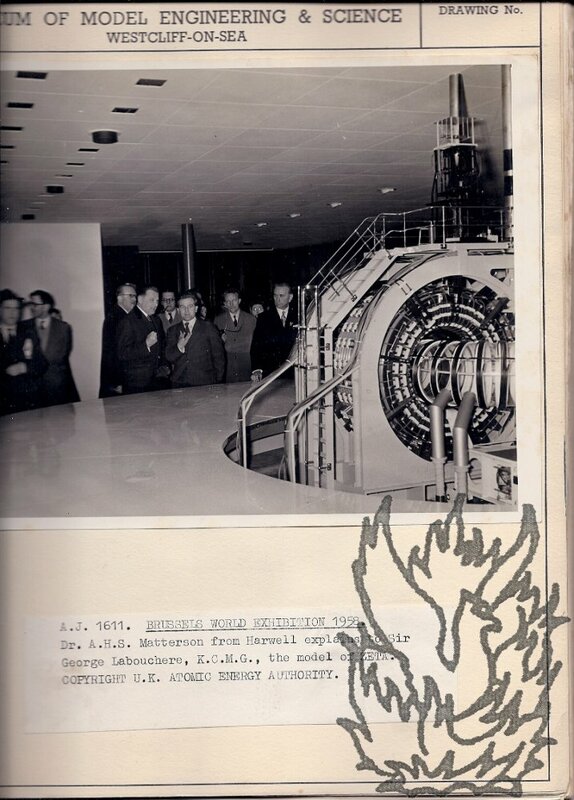 A major experiment in the early history of fusion power research, Zeta was operational from 1957 to 1968. The Science Museum has in its archive collection an 'Encyclopaedia of the World's Aircraft and Astronautics' by Appleby.